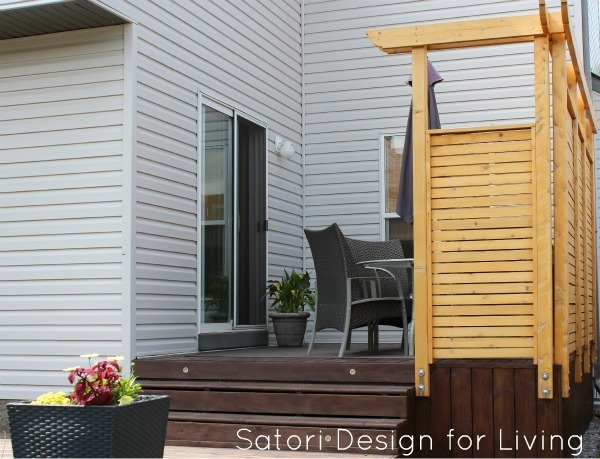 Our total deck revamp, including the addition of a lower section and cedar privacy partition is finally done! When we moved to our current home, one of the biggest adjustments from living in a rural area was the lack of privacy in our back yard. I’m not saying we wanted to shut our neighbors out completely. We just didn’t want everything on display all the time, and I think the feeling was mutual. Over the years to help alleviate the problem, we added some trees and built a stone patio that allows us to sit lower in the yard. The last thing that remained on our privacy to-do list was to construct a partition around the upper deck. What we started with was a small upper deck that was here when we moved in. I was grateful to have something, but the painted spindles were challenging to maintain and I never felt comfortable spending time on it. It was definitely time to do something about it. 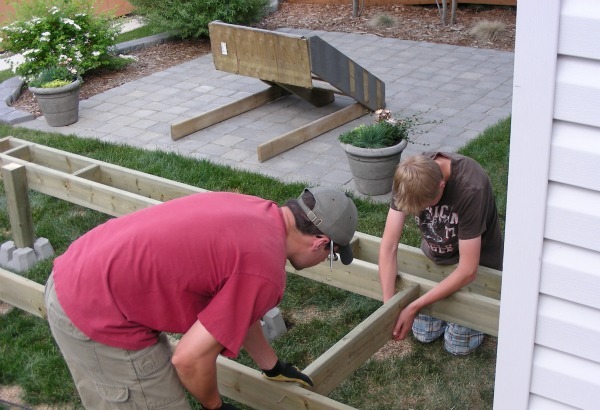 After some research, sketching and careful planning, we started the deck revamp process. 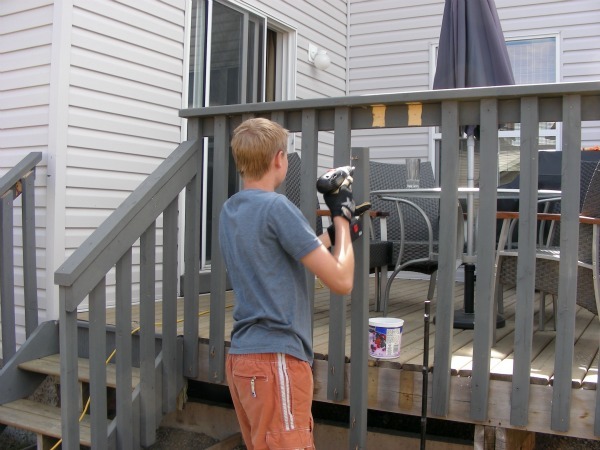 My son put his power tool skills to work and began taking down the spindles. Of course my husband had to try to show him up (competition is always in full force between the two!). Because the deck was quite small, we decided to add a lower area for lounge chairs or for entertaining larger groups. We stepped it to the side to connect better to the stone patio. 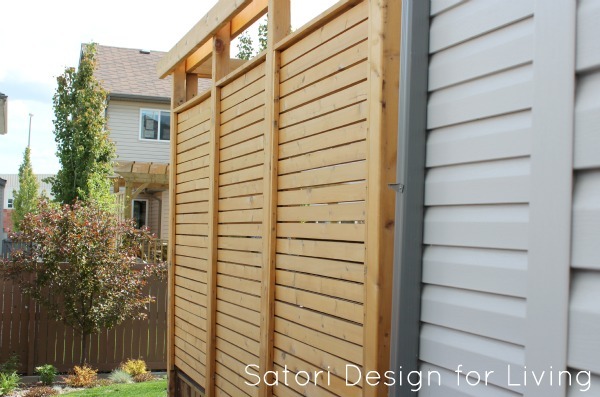 After finishing the deck addition, we began to build the privacy partition. The posts went up quite easily and quickly, but the horizontal strips required a tedious amount of cutting and air-nailing. As a result, taking progress pictures slipped my mind. Here’s how the whole thing looks now (after days and days of work)! After staining the whole thing a deep walnut color, the two deck surfaces look like they were always there. We used cedar for the partition and gave it a clear coat to prevent it from weathering. To tie the lower deck in with the stone patio, we added slate stepping stones and rock. We also added outdoor lighting down the stairs and on both sides of the lower deck for safety and ambiance. Now when we’re eating outside, we feel a lot more comfortable. The partition also helps cut the wind, allowing us to sit out there even when the weather isn’t ideal. The next step will be sourcing furniture for the lower deck and taking some time this summer to enjoy it! Be sure to check out all of the other Outdoor Build-it Projects as part of the Outdoor Extravaganza. Today is Tiffany’s turn to host and I’d love for you to join us! This is amazing! I love the design of it! Perfect for some privacy and super cozy! This is FABULOUS! 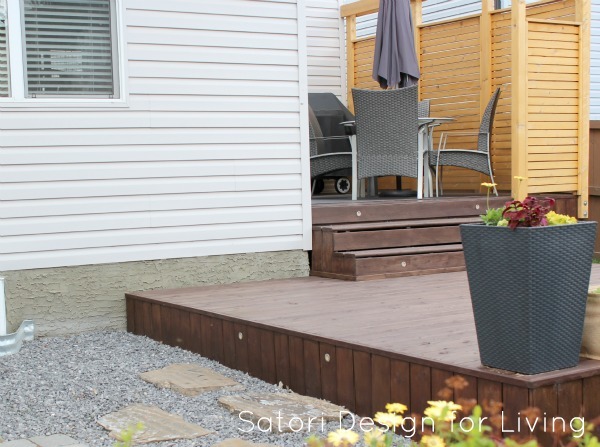 I love how you didn’t stain the cedar – it provides a lovely contrast to the deck extension. Also, I really like the stone surrounding the deck. Great job! Thank you, Michelle. We really like the change. Really nice addition. I think you’re going to enjoy this change a lot! Your deck area looks so inviting, I love the contrast between the stain, the wood and the rock. Turned out great! Love the horizontal slats. I did this at my last home and it really is a great contemporary look. Not too fun to cut and install, but worth it! Looks amazing Shauna! I love the patio furniture – very sleek and modern. Love it! I really like the layered look of upper/lower decks and stone patios all tied together. Great job! Love it! 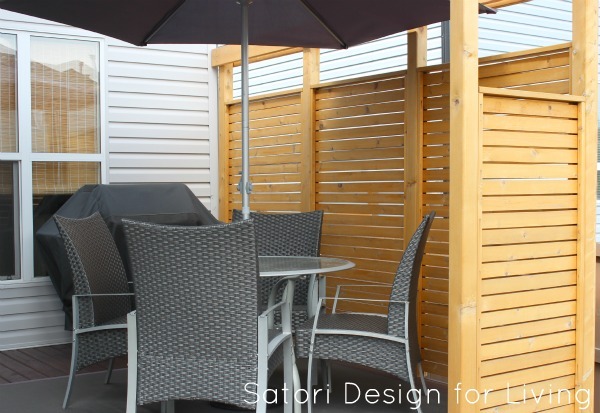 The partition is a great idea…I never could figure out how to have a deck without feeling like I was staring into the neighbors’ back yards.